In the past three decades, almost 4,000 planet-like objects have been discovered orbiting isolated stars outside the solar system (exoplanets). Beginning in 2011, it was possible to use NASA's Kepler Space Telescope to observe the first exoplanets in orbit around young binary systems of two live stars with hydrogen still burning in their core. Brazilian astronomers have now found the first evidence of the existence of an exoplanet orbiting an older or more evolved binary in which one of the two stars is dead. The findings have just been published in the Astronomical Journal, published by the American Astronomical Society (AAS). Leonardo Andrade de Almeida, first author of the article, said, "We succeeded in obtaining pretty solid evidence of the existence of a giant exoplanet with a mass almost 13 times that of Jupiter in an evolved binary system. 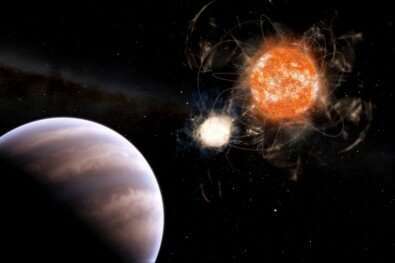 This is the first confirmation of an exoplanet in a system of this kind." Almeida is currently a postdoctoral fellow of the Federal University of Rio Grande do Norte (UFRN), having conducted postdoctoral research at the University of São Paulo's Institute of Astronomy, Geophysics and Atmospheric Sciences (IAG-USP), where he was supervised by Professor Augusto Damineli, a coauthor of the study. Variations in eclipse timing (the time taken for each of the two stars to eclipse the other) and orbital period led the researchers to discover the exoplanet in the evolved binary called KIC 10544976, located in the Cygnus constellation in the northern celestial hemisphere. "Variations in the orbital period of a binary are due to gravitational attraction among the three objects, which orbit around a common center of mass," Almeida said. Orbital period variations are not enough to prove the existence of a planet in the case of binaries, however, because binary stars' magnetic activity fluctuates periodically, just as the sun's magnetic field changes polarity every 11 years, with turbulence and the number and size of sunspots peaking and then declining. "Variations in the sun's magnetic activity eventually cause a change in its magnetic field. The same is true of all isolated stars. In binaries, these variations also cause a change in orbital period due to what we call the Applegate mechanism," Almeida explained. To refute the hypothesis that variations in the orbital period of KIC 10544976 were due only to magnetic activity, the researchers analyzed the effect of eclipse timing variation and the magnetic activity cycle of the binary's live star. KIC 10544976 consists of a white dwarf, a dead, low-mass star with a high surface temperature, and a red dwarf, a live (magnetically active) star with a small mass compared to that of the sun and scant luminosity due to low energy output. The two stars were monitored by ground-based telescopes between 2005 and 2017 and by Kepler between 2009 and 2013, producing data minute by minute. "The system is unique," Almeida said. "No similar system has enough data to let us calculate orbital period variation and magnetic cycle activity for the live star." Using the Kepler data, they were able to estimate the magnetic cycle of the live star (red dwarf) based on the rate and energy of flares (large eruptions of electromagnetic radiation) and variability due to spots (regions of cooler surface temperature and hence darkness caused by different concentrations of magnetic field flux). Analysis of the data showed that the red dwarf's magnetic activity cycle lasted 600 days, which is consistent with the magnetic cycles estimated for low-mass isolated stars. The binary's orbital period was estimated at 17 years. "This completely refutes the hypothesis that orbital period variation is due to magnetic activity. The most plausible explanation is the presence of a giant planet orbiting the binary, with a mass approximately 13 times that of Jupiter," Almeida said. How the planet orbiting the binary was formed is unknown. One hypothesis is that it developed at the same time as the two stars billions of years ago. If so, it is a first-generation planet. Another hypothesis is that it formed out of the gas ejected during the death of the white dwarf, making it a second-generation planet. Confirmation of its status as either a first- or second-generation planet and its direct detection as it orbits the binary could be obtained using the new generation of ground-based telescopes with primary mirrors exceeding 20 meters, including the Giant Magellan Telescope (GMT) installed in Chile's Atacama Desert. The GMT is expected to see first light in 2024. "We're probing 20 systems in which external bodies could show gravitational effects, such as KIC 10544976, and most are only observable from the southern hemisphere. The GMT will enable us to detect these objects directly and obtain important answers on the formation and evolution of these exotic environments, as well as the possibility of life there," Almeida said.